This is another masterpiece ordered by Charles of Bourbon. It is a huge building commanding a view over the whole city of Naples, once the seat of one of the world’s most famous manufactures and now housing one of the richest Italian museums. On 10 September 1738 the construction work for this palace begun. In 1734 Charles was the sovereign of Naples and Sicily and he immediately ordered the construction of this new Palace to be the first concrete sign of his willingness to make the Kingdom independent from Spain and sovereign from all points of view. 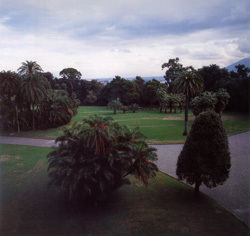 Since the beginning, Charles chose the vast woods of Capodimonte (124 hectares) as site for the future Palace, from which he could admire the gulf and the city, laying mid-way between the Vesuvius, the hill of San Martino and Posillipo. And since the very beginning the King gave the Palace the double function of royal residence and famous museum, just as Palazzo Pitti in Florence. The architects who conceived the work were Giovanni Antonio Medrano from Palermo and Antonio Canevari from Rome, who later showed a very disreputable mutual rivalry. In the ’50s – ’60s, the general work supervisor was Ferdinando Fuga. Medrano produced three different projects: in the end, the “C” design was chosen (it is still kept in Capodimonte). This project foresaw a vast rectangular palace (m. 170 of length and m. 87 of height), with a mezzanine and two storeys and lofts for its vertical construction (m. 30). The chosen style was the neoclassical one, the typical style of famous European Courts; its solemn and stately structure had to celebrate the dynasty. The external and internal facades of the Palace were built in a rigorous and severe Doric style (the most suitable for a palace destined to house also a museum) and in a sixteenth-century gusto, with strong frames in gray marble in a mastery contrast with the Neapolitan red of plastered walls. During the first months, the work went on quickly and the many problems created by the transport of materials on top of the Capodimonte area were solved. At that time the area could be reached only through a steep slope and therefore tuff bricks were dug out from the foundations and huge and deep wells were created to face the inveterate lack of water. 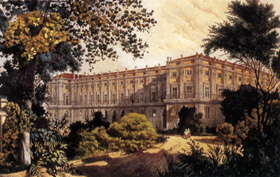 Then a the work slowed down, due to both economic reasons and the fact that Charles begun to imagine and realise the grand project of the Royal Palace of Caserta. 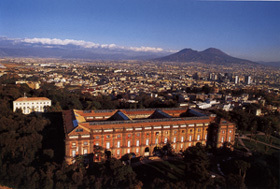 The work was resumed with promptness in the ’60s, under the rule of Ferdinand IV and Tanucci (in these years, however, the construction of the Royal Palace of Caserta was slowed down); but only under the rule of Ferdinand II was the palace completed, and the northern yard added up, under the lead of architect Tommaso Giordano and the supervision of Antonio Niccolini. The vast hunting park plaid an important role. Hunting was not just a passion of the Bourbon of Naples, but a real «function of State; a variegated Court formed by ministers, nobles, foreign guests, often Heads of State, artists and painters called to depict the scene as an official ceremony, accompanied the sovereign». [Capodimonte. Da Reggia a Museo, della Soprintendenza per i Beni Artistici e Storici di Napoli e Provincia, Elio de Rosa editore, Napoli 1995, p. 9. We drew information from this work. See also: Museo Nazionale di Capodimonte, a cura di N. Spinosa, Soprintendenza per i Beni Artistici e Storici di Napoli e Provincia, Electa Napoli, 1994; N. SPINOSA, Capodimonte, Soprintendenza per i Beni Artistici e Storici di Napoli e Provincia, Electa Napoli, 1999)]. Unlike other royal parks, the “Bosco”, traditionally ascribed to Ferdinando Sanfelice, was conceived in an autonomous way in connection to the location of the Palace and its framework studied to perform the hunting activity. It has more than 4000 different types of centuries-old trees, among which oaks, chestnut trees, pines, cypresses, lime trees and holm-oaks. A second scenographic framework was realised, in a clear baroque style, with five very long tree-lined roads dotted with marble statues spreading from the entry square and with other narrower roads which crossed the large ones in a maze of striking views and a rich natural vegetation, «so to combine the traditional gusto for the ordered and symmetrical perspective of the “garden Italian Style” reorganised according to French examples and the most recent romantic interest in the apparently spontaneous “English garden”» [In Museo Nazionale di Capodimonte, cit., p. 8]. Disseminated in the vegetation, there are a series of buildings destined to the life at Court (Queen’s Chalet, Princes’ palace), royal factories (among which the Porcelain Manufacture),religious buildings (Church of San Gennaro, Hermitage of the Capuchins), and agricultural and zootechnical activities (Fagianeria, Cellaio, Vaccheria). Another park to be mentioned in the “Parco della Statuaria”, realised with fountains, roads and hunting lodges. During the years, the Palace housed illustrious protagonists of the European culture such as Winckelmann, Fragonard, Angelika Kauffmann, Canova, Goethe, Hackert, the latter restored ruined paintings and organised the art gallery. Already in 1735, King Charles gave orders to transfer the Farnese’s collections inherited by his mother Elisabeth Farnese to Naples. These vast collections, made by paintings, drawings, bronze statues, artistic objects and pieces of furniture, medals and coins, gems, cameos and other archeological materials were mainly arranged in the Palazzo della Pilotta in Parma, and some of them in the Palazzo del Giardino always in Parma, in the Palazzo Ducale of Piacenza, the residence of Colorno and the Farnese Palace in Rome. Those objects of low value were not included in the inventory (Just a few of them, of course), whereas the other artistic works were transferred to Naples, at first put in the Royal Palace and then moved to Capodimonte as soon as the Palace was ready to house the museum. In 1739 a committee of experts were tasked by the sovereign to study the most suitable way to arrange part of the collections from Parma: the paintings were put in the rooms facing south and the sea, since they were drier and had a better light, whereas books, medals and other objects were put in the so-called “backrooms”, facing the woods. Only in 1758, however, the first 12 of the 24 rooms destined to the library, the collection of medals, the paintings and antiquity collection were completed at the upper floor. Before the pillage made by Napoleon’s troops in 1799, there were 1783 paintings (the original Farnese pinacoteca only had 329 paintings and not all of them were moved to Naples by Charles); it is clear that, beside the Farnese collection, the museum already exhibited works from the Bourbon collection. The French took more than 300 of them [Ivi, p. 9]. The masterpieces collected by Cardinal Borgia and purchased by Ferdinand I in 1817, Egyptian, Etruscan, Greek and Roman antiquities, among which the famous “Globo celeste”. Moreover, the museum included a graphic arts collection, one of the most important of Italy, and the new group of works by contemporary artists. The exhibitions confirmed the rigour, passion, culture, daily management of a huge historical patrimony that took a curtain call among the international artistic circuits. Other “pillages” took place in 1860, when the Kingdom was occupied by Garibaldi: less than 800 out of the 900 and more paintings were left in the museum [Ivi, p. 10]. 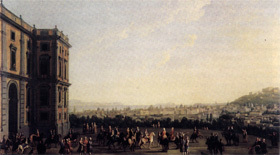 The Royal Palace of Capodimonte became a National Museum after the Unification.